The travel blogging community is once again uniting for Passports with Purpose. In 2009, 90 bloggers participated and raised almost $30,000 to build a school in rural Cambodia. In 2010 the goal is to raise $50,000 to build a village in rural India through a partnership with Friends of Lafti. This is how it works: Each blogger has secured a prize for a raffle. I’m donating a $100 gift certificate to B&H Photo, which I will send anywhere in the U.S. Check out the Passports with Purpose home page to participate, for more details and a full list of prizes. Donors make a tax deductible donation directly to LAFTI International. For each $10 donated, you can be entered to win a prize of your choice. Winners will be announced December 17th. LAFTI helps India’s untouchables, especially women, with projects that include land distribution, cultivation, adult training, youth housing and housing construction. For about $2,000, LAFTI can build a home. 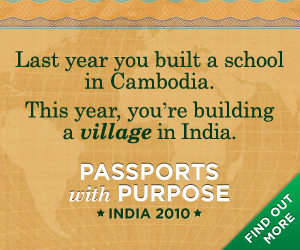 Passports with Purpose aims to raise enough money to build approximately 25 homes to create the Passports Village in Karunganni, located in the state of Tamil Nadu, India. Travel bloggers Debbie Dubrow, Pam Mandel, Beth Whitman and Michelle Duffy founded Passports With Purpose in 2008 as a way to build community among travel bloggers and to give back to the places we, as travelers, visit. So glad that Dalits are getting support. I love PWP. The slogan is truly inviting, and I think this outreach program is essential for all travel bloggers, I hope to see donations from other sectors too.